Photo Credit: Julián Aguilar/The Texas Tribune as reported in The Texas Tribune on 7/31/18. 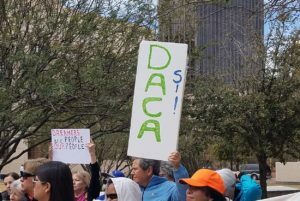 The future of DACA, the Deferred Action for Childhood Arrivals program, will become clearer as federal courts wrestle with the Obama-era initiative to shield young immigrants from deportation. And the U.S. Supreme Court may end the controversy once and for all. The Washington Post reports that on Friday, Aug. 17, U.S. District Judge John D. Bates ruled that the Trump administration must continue processing renewals but that the administration can halt new applications for “Dreamers” while DACA is under appeal. “Bates is one of the federal judges presiding over four different lawsuits aimed at maintaining or eliminating DACA, which was created by executive order by President Barack Obama and then ended by President Trump,” the Post reports. The fate of DACA could ”end up in the hands of the U.S. Supreme Court,” the Texas Tribune reports. “In June, the Department of Justice asked Hanen to delay a possible injunction ‘so the United States can seek stays of all the DACA injunctions in the respective courts of appeals and the Supreme Court,’” the Tribune notes. Does a New Breed of Pilot Error … Fighting Automation to the Ground … Need a New Kind of Pilot?